Zoya PixieDust - Chyna and Nyx - Polish Etc. When the liquid sand/pixieDust polishes first made their appearance I was a bit skeptical. I'm not a huge fan of rough finishes and will keep layering top-coat over a glitter polish until it is as smooth as glass. Until recently, I wasn't even a fan of matte finishes, but they are growing on me. I haven't purchased any of the OPI Liquid Sand polishes because they just don't intrigue me that much, several of the PixieDust shades however, were quite beautiful. I saw swatches on The Manicurator (if you don't already follow her blog you simply must, she has the most gorgeous pictures I've ever seen) where she applied top-coat to each of the PixieDust polishes and they looked so beautiful I decided I could always wear them that way. Without further ado, here's my picks: Chyna and Nyx! Chyna is right up my alley, it's a beautiful dark (blue-based) red base loaded with metallic red glitter and PixieDust particles. This is two coats. With top coat Chyna reminds me of China Glaze Ruby Pumps or Butter London Chancer (two of my favorite red glitters). Nyx is a dusty sky-blue with silver glitter and PixieDust Particles. This is three coats. These two colors are so much more sparkly than they appear in photographs. Usually a blurry photo will catch glitter, but the PixieDust is different. It really does sparkle like the sun on a beach full of fine sand, or perhaps that thin layer of frost on an autumn morning.While the glitter adds sparkle in both of these shades so does the PixieDust, and when you add top coat this additional sparkle disappears leaving a fairly plain, boring glitter polish.With most polishes you add top coat to make them sparkle more, with PixieDust adding top coat takes away from the sparkle. The formula for both of these was very nice. Two normal coats gave me full coverage, but a third adds more of the rough matte texture. If you look closely at my pictures of Chyna you can see where I must have used thicker coats on my index finger because it has more glitter and PixieDust and less of the shiny base color comes through. These do dry rough. I'm really not fond of the rough finish. I'm told these are smoother than the OPI Liquid Sand finishes, but they aren't as soft as Layla Softouch or any other matte finish. 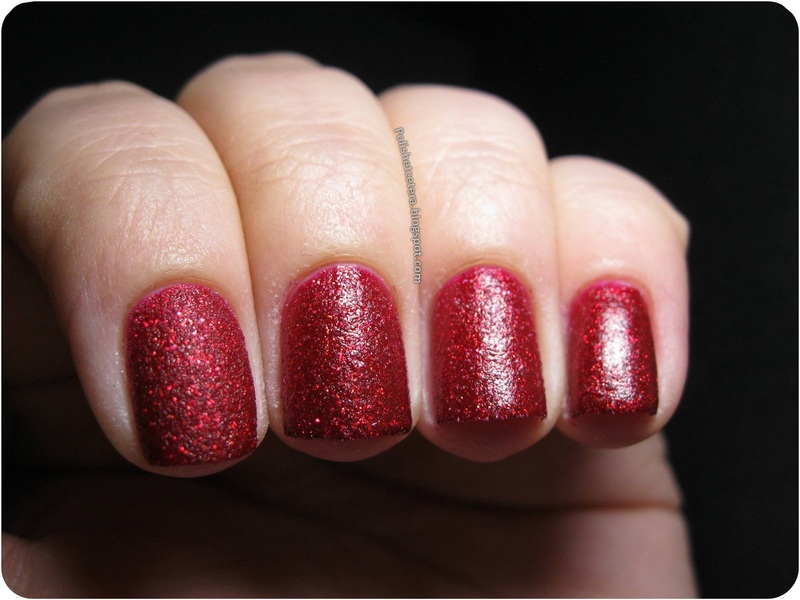 If you purchased any of the China Glaze fine-milled glitters this holiday season such as China Glaze Glistening Snow you have a pretty good comparison. Without top coat Glistening Snow has the same rough texture of PixieDust with about half the sparkle. I've heard that these take a long time to dry, but to me dry time was normal for a glitter polish, the biggest difference is that we typically add fast-dry top coats to our glitters before they are truly dry, but you can't top coat PixieDust so it seems to take longer to dry, but truly doesn't. What do you think of textured polishes? Have you purchased any? Lovely swatches! I never liked the "stick things on your nails" trend (like caviar nails), but I am really enjoying textured polishes. So far I just have the OPI ones, but I'm planning to get a Zoya or two, and also hoping they show up in the drugstore soon! I still am on the fence about these. I'm not a fan of texture, I guess..... ? Something is keeping me from buy them. I agree with you on the "stick things on your nails" trends! I can't even really stand rhinestones or studs (I usually wear them for pictures then take them off) because they just feel big and awkward. I haven't tried caviar nails yet but I'm sure it would be the same thing, add beads to an old mani, take pictures, remove beads. :) I haven't seen any of the OPI sands in person but I don't really like the colors for most of them, but the blue is nice. The Zoyas are definitely pretty but I haven''t worn them long enough to know if the texture would bug me! I'm not a fan of the texture either, but with a few coats of top coat (I used three of a new bottle of Seche Vite) they're just as smooth as any glitter nail polish. I haven't tried wearing them yet to know if the texture would annoy me, but it's pretty rough! I usually like the smooth shiny look but I took a chance with the OPI Liquid Sand polishes and fell in love. Oddly enough, I quite liked the rough-ish texture on my nails. I will definitely be getting at least one of the Zoya's. I just bought NYX today and I am going to do a mani tonight. Such a beautiful shade...we'll see how I do with the texture!